If you’re not careful, you can flush a lot of money right down the drain with an ill-conceived Pay-Per-Click campaign. Of course, that’s true with any form of advertising. The problem most people run into is they don’t properly account for the (vital) importance of relevancy in their online advertising campaigns. It’s funny, the Wall Street Journal just shared a study on persuading people that underlined what successful direct marketers have known for years: Personalization and Localization of ‘creative’ will lift response. The same is true for pay-per-click advertising. And not only that — Google actually charges you LESS for ads that perform better. If your advertisement is attached to a highly relevant keyword that goes to a highly relevant landing page — not only will you see a lift in your response, you’ll also get preferred positioning on the page AND your cost-per-click with go down. I know…seems counter intuitive, right? See, many advertisers use Google because it delivers such highly relevant responses to search queries. But Google fears that their site will get junked up if people can just throw money at a poorly performing ad and dominate the advertising space. So, Google is incentivizing advertisers to create ads that actually help searchers accomplish their goals. That and when advertiser’s ROI goes up they spend more and more money. It’s really quite brilliant. With that in mind here are some ideas you can use to both increase the number of conversions you get from pay-per-click advertising, while at the same time reducing your overall cost. Group like-minded keywords into similar ad groups – as an example if you sold picture frames online you would want to break up keywords related to ‘poster framing’ from ‘fine art framing’. What’s more – you may even decide to break out these groups into geo-located campaigns targeting specific cities. Create relevant Advertisements – For each ad group create text ads that are relevant to those particular keywords. If you’re talking about ‘posters’ use the word posters and frame (pun intended) in the call-to-action in a way that will resonate with the intended person typing in the keyword phrase. Create relevant Landing Pages specifically FOR those Advertisements – That’s right. You’re going to create custom landing pages for people searching for ‘Poster framing’ vs. those searching for ‘fine art framing’. These are two separate and distinct audiences and you need to address them with imagery and language that resonates with their original query. Author’s note: While #3 above may seem like a hassle, it really has three benefits. It will help increase your quality score your costs will go down, it increases the effectives of your campaign so you get more conversions, and lastly it helps you on the ORGANIC search engine optimization front. If you increase the number of pages on your site that have 10/10 Quality Score scores for a specific keyword, you’ll increase its ranking for organic search traffic. Google Ad Extensions give potential customers more information about your business so they are inclined to ‘click’ on your advertisement. You can include information such as your phone number, physical address, links to additional pages within your websites, and customer reviews. This extra information helps you differentiate yourself from the competition and just makes your ad more attractive to people. This relates to something I mentioned in Step #1 for in increasing your Quality Score. 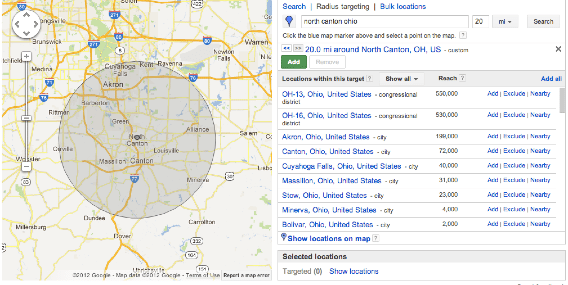 Using Adwords’ geo-targeting features in Google Adwords you can target ads for specific locations. So an ad for someone in Akron, Ohio vs. Someone in Cleveland, Ohio can be presented with a unique combination of advertisements and landing pages. There are a couple of ways to do this – targeting a radius around a location, metropolitan areas or even targeting people in specific airports like the Akron Canton Airport (great for local hotels, restaurants & travel services). By default, you’re targeting people who are in, searching for, or viewing pages about your target location. However, you can even tighten that up to the point where your ads only present to people physically in a specific geographic area. Conversion tracking is a free Google Adwords tool that provides reports after someone clicks on your ad — did they buy your product, did they sign up for your email list? Conversion Tracking lets you understand the Return on Investment for your online advertising efforts. Conversion tracking involves adding some additional code to your site and changing some settings on your Adwords campaign, but it’s not too difficult and Google provides you with plenty of guidance to make this as painless as possible. Do your keyword research – seek keywords that are higher in volume and lower in competition (cost). Again, be sure to look for groupings that make sense and break these off into campaigns that merit their own specific text ads and landing pages. Budget wisely– minimize your risk at first by setting a lower budget and build it from there. That said, a $10 a day budget won’t do you much good if you’re bidding on keywords that average $5 a click. If you’ve done your keyword research, you’ll have an idea about how much each click will cost you. You’ll want to get enough clicks to ensure that you have a good sample size from which to make future decisions. For the small businesses we work with, I’d suggest a minimum monthly budget to ‘test the waters’ would be between $300 to $500 per month. Bid carefully and don’t be afraid to use Google auto-bidding features at first until you get your arms around what keywords are most valuable to YOU. Let it run for a reasonable length of time – in my opinion, a one-month run is minimum. However, I would really push for 3-6 month commitment in order to allow for campaign testing, refinement and seasonality. Be sure your best performing ad is given priority – Test multiple text ads for each ad group. Google’s default setting is to rotate the ads so that they are ‘optimized for clicks’. It’s best to let them manage the rotation and float the most effective ad to the top. However, after a good period of time with conversion tracking enabled you may consider going into advanced settings and selecting ‘optimize for conversions’. Do NOT set it and forget it – if your team doesn’t have time, expertise or discipline to manage your PPC effectively then hire the best local PPC management company you can find. By being local, you can have face-to-face accountability and a good company will be able to work with you to meet your goals. Please contact us if you’d like more information about how we can help you get more bang for your buck with your online advertising campaigns.